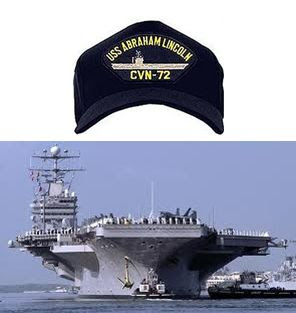 USS Abraham Lincoln, an aircraft carrier of United States 5th Fleet, presently deployed in the Arabian Gulf has some interesting features, as reported by The News. Commissioned on Nov 11, 1989, the carrier is massive body that displaces 97,000 tonnes. in to the sea when fully deployed. No fewer than 15,000-20,000 meals are served on board which has 1,900 shipboard telephones, four flight deck catapults and is equipped with 2,530 tonnes of AC capacity that is enough to serve 800 homes. 13,000 sodas are consumed aboard the USS Abraham Lincoln, no less than 600 gallons of milk is drunk daily and 620 pounds of hamburgers are eaten by human on-board. While 180 dozen eggs are consumed on this ship, 800 pounds of vegetables and 900 pounds of fruits are also eaten daily. Furthermore, 5,550 pounds of laundry is cleaned on the deck and 250 haircuts are given to the soldiers based on the USS Abraham Lincoln.